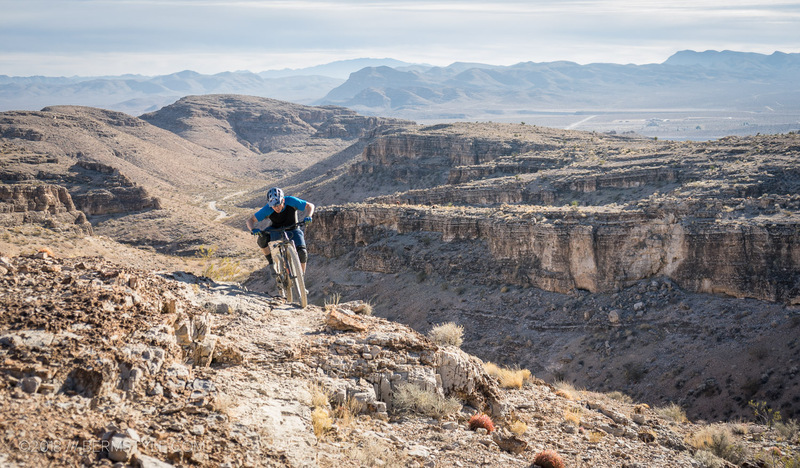 The Southwest Ridge Trails combine technical desert riding with epic views and even feature some pieces of high speed flow. 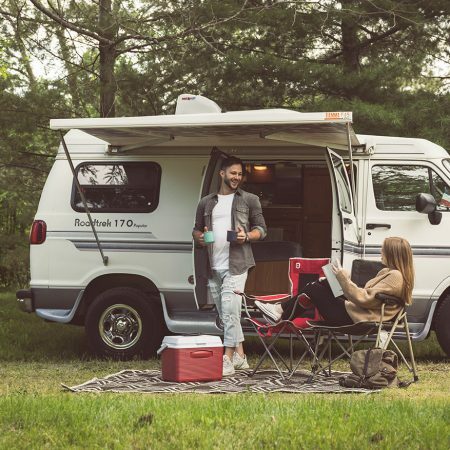 For the last few weeks I’ve been away from desk and spending every evening in the driveway working to finalize upgrades to our #vanlife conversion in preparation for our escape from the northwest. Our destination? 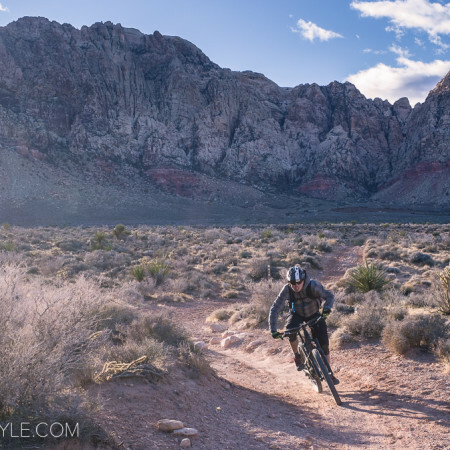 The sunny trails of Nevada and southwest Utah. 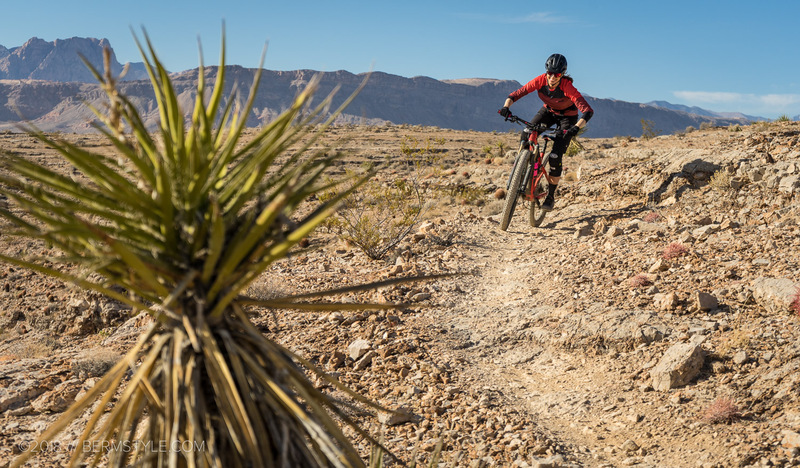 With family based in the Las Vegas area, it was our main base of operations during our week of travel, but its also home to one of our favorite desert rides: the SW Ridge Trail. 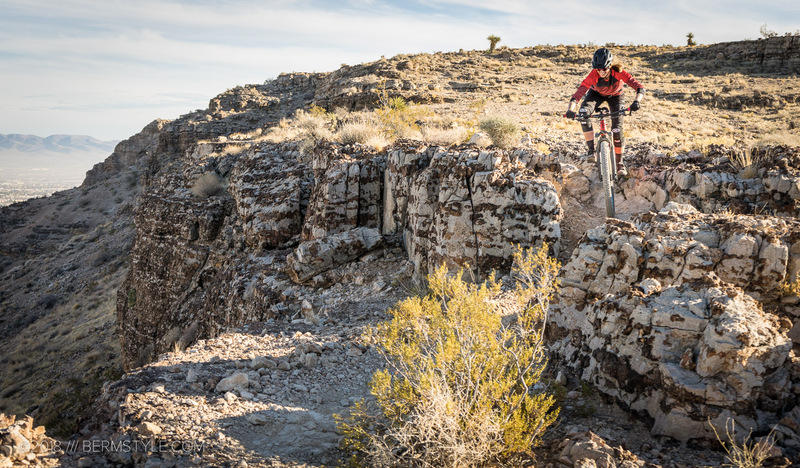 Butted up against the suburbs, the trails make an amazing afterwork ride for the locals, but feature destination worthy terrain and epic views. 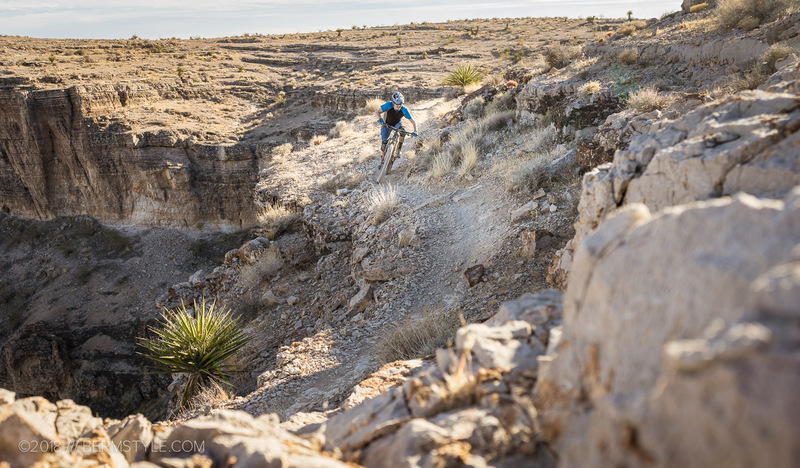 When we last rode it in 2015, the route consisted of a single 6 mile loop, which is now referred to as the Ike’s Peek Loop. Epic views of the canyons are reminiscent of old Hollywood Cowboy movies. I recall at one point looking off over the valley at the next mesa and thinking the only thing this trail needed.. was more trail. 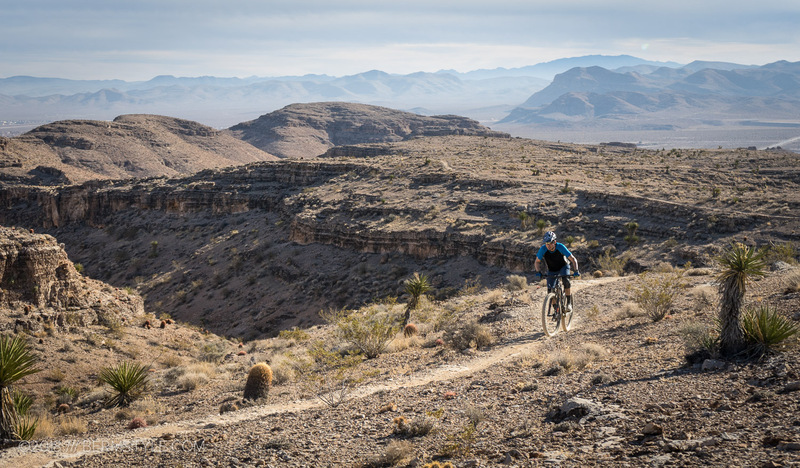 It really has everything we look for in a trail – technical trail features, great descents, challenging but fun climbs with reasonable grades and amazing views, all in an amazing desert landscape. To the left is a sizable fall… and sweeping views of the city of Las Vegas. 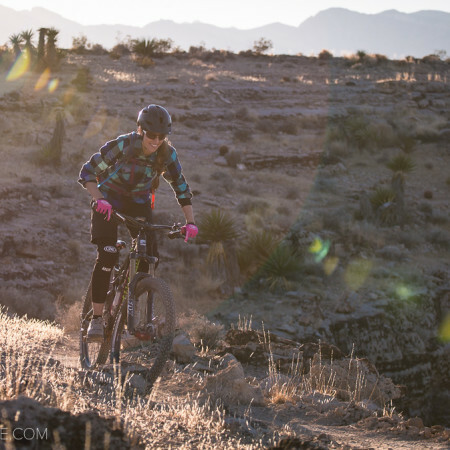 Two years later and the trail has evolved – not only has the trail expanded in terms of milage but there are a number of different climb and descent options, doubling and tripling the fun. 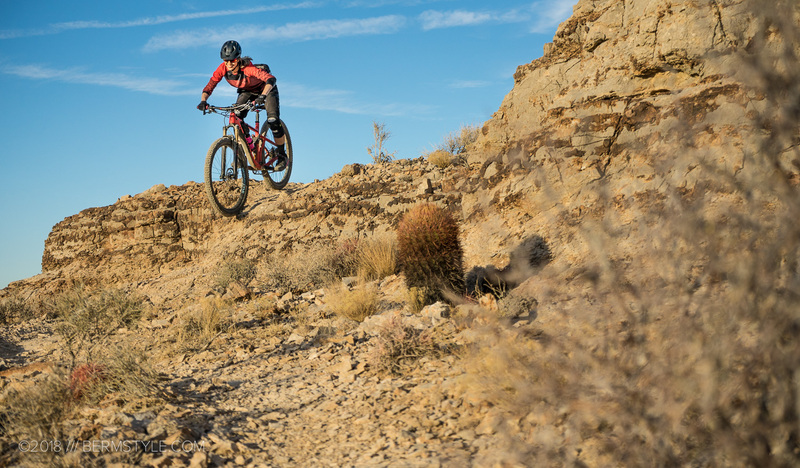 A number of new routes hewn into the rock now allow you to connect to additional loops, and ride to the next mesas on single track. 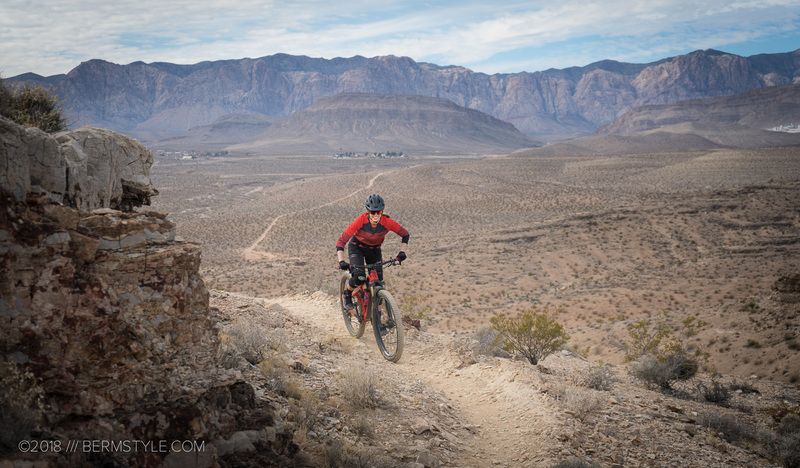 If you don’t mind riding double track, you can even connect to the next trail system on the other side of the highway, the Blue Diamond Trails. The views on this trail are on par with far more popular trail destinations. Having ridden Ike’s Peek a number of times, our favorite starting point had been to park in the neighborhood off S Grand Canyon Drive. With all the new miles of trail to explore, this time we opted for the parking lot a bit further down Blue Diamond Road. It was a solid move, and after visiting with some local riders that were wrapping up their morning ride, we elected to try a new route, climbing the center ridge titled “Good Call”. Be careful to stay on trail as plants in the desert are unforgiving. Although they warned of a steep climb initially, it wasn’t that notable to us after the ride we had done the day prior, which had involved a substantially steeper grade. It was easily manageable with a 32-42t 11 speed drivetrain. Connecting to Ike’s Peek on the ridge, we rode along the views enjoying the sights and exposure to connect the dots and exploring further before returning to ride Legalize it, and descending on the BiPolar Trail. 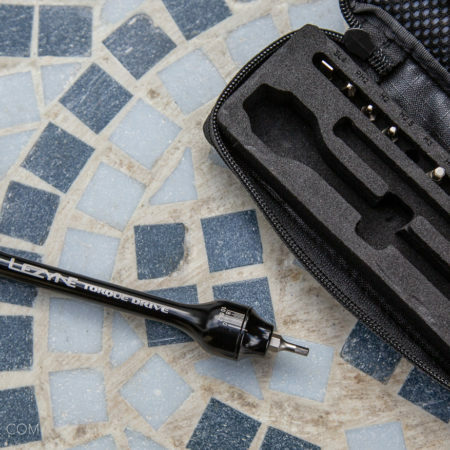 We recommend tires with sturdy casings for trips to the SW.
Bipolar was a fantastic surprise with far more flow than expected. Although our trip continued over the next few days into southwest Utah, it ended up being one of the highlights of our week.